One Moon is luxury lifestyle brand known for our hand crafted cashmere capes and wraps as well as personalised travel blankets. Our pieces are made in New York using the finest materials available and feature classic silhouettes with a modern twist. We design to keep you chic from day to night, from the city to the country—for the woman on the move. Why do you think that Londoners love One Moon? I think it has to do with One Moon’s combination of function and style. Londoners have an effortless fashion sensibility that reflects urban necessity and historical elegance. Our pieces are perfect for layering and work well in any climate as a fun alternative to outerwear. Many of our pieces are limited edition cashmere and trim, which makes everything very individual. Lastly, we can special order if people want to add their own special touch. It’s always interesting to see what people are drawn to. There are certain styles, such as the Solstice wrap, that work well on everyone. It’s especially perfect for travel and is a wardrobe staple that clients buy in multiple colours. Another good sign of a popular item is if our employees insist on wearing the samples around the office! What do you love most from your Fall/ Winter 2015 collection? I am so excited that we are using Loro Piana cashmere exclusively for our Fall/Winter 2015 line. We are also developing some new styles, like our Stevie wrap, which is a triangle shape with fringe – very chic, but also edgy and fun. 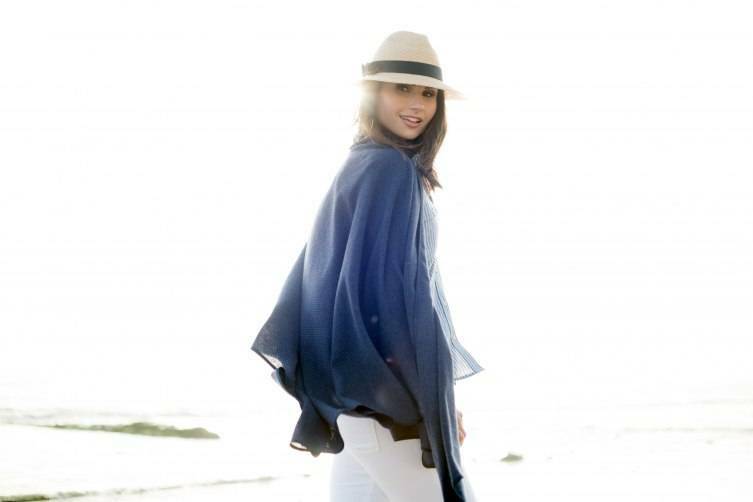 Our new Bel Ami wrap is classically feminine and more like traditional outerwear than most of our pieces. I just love everything. I have always been enamoured with Londoner’s individuality and self expression. It seems to be all in the details, as well as the perfect mix of luxe and high street pieces. How much of your wardrobe is from One Moon? I would say it rotates, as I have had many of my pieces literally bought off of my back! When I first started in 2012 we had a very small line and inventory… the first time I decided to keep one for myself and wore it out to dinner someone in the restaurant bought it off me. I do have a black Solstice wrap that I had monogrammed with my initials. I love layering it over my Isabel Marant leather jacket. I take it with me everywhere! I’ve always loved fashion. I worked in retail growing up and my mother always had a strong sense of style. She always dressed for the day, regardless of what we were doing. My style has evolved over time and since I relocated to California 20 years ago. Californians do effortless and casual chic very well, which are two things I value. Lastly when you’re not busy with One Moon, how do you like to relax? I really enjoy yoga and meditation. Last summer I went to Maui (Hawaii) on a yoga retreat for my birthday I came back feeling energised and inspired. I went alone and met some truly inspiring women. As a matter of fact, someone bought one of my One Moon wraps off me there as well!